Lightweight and shaped like an M4 magazine this is the ultimate speed loader. Made from LEXAN Plastic this is the STRONGEST speed loader in the world. Lexan (LEXAN) is a highly durable polycarbonate resin thermoplastic. Convenient and useful, this high-capacity speed loader is similar in shape and size to a M4/M15 magazine and fits perfectly in a spare magazine pouch or pocket. A sliding panel opens for easy filling of the speed loader, match its opening to any AEG magazine and a spring loaded plunger lets you quickly fill the magazine. The transparent design lets you see how many 6 mm BB's are left. The plunger can be locked down for storage. 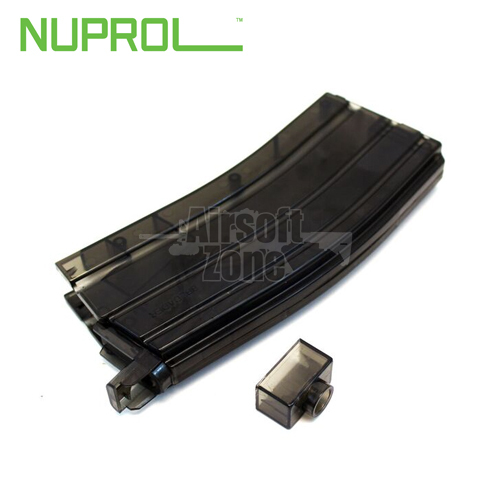 A built-in flip-up adapter for use with pistol magazines as well as a lose adapter for magazines with wide openings is included. Contains approx. : 470 6mm BB's.